I’m taking a course at Oxford this summer on “The Brain and the Senses.” So this is a little extra homework. The idea of memory, where thoughts come from, etc., is fascinating to me. And, many years ago, before I was there, Eric Kandel had his laboratory at the Public Health Research Institute, of which I was later CEO. Unfortunately for me, we have never met. I HAVE NOW COMPLETED BOTH THE COURSE AND KANDEL’S BOOK. The course, offered by Oxford tutor Gillie McNeill, combined descriptions of sensory processes with an explanation of the underlying molecular activity that integrates the incoming perceptions and what’s already in memory to create a coherent narrative. We started by eating a cracker and considering what was involved in our individual perceptions of that event … taste, smell, sight, feel, sound, and memory of crackers and herbs previously ingested. Quite a bit for one bite in the first few minutes of the course. 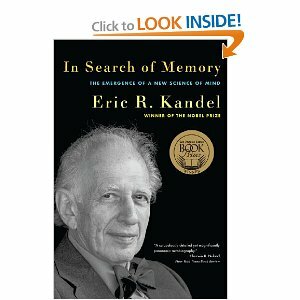 Kandel’s book offers enchanting glimpses of his life story, the history of brain psychology and science, and a description of the experiments (of Kandel and others) which are moving our understanding of the brain forward at an incredible pace while also revealing just how little we still know. Kandel’s decision, early in his career, to begin his life’s work with the study of a single cell, set the stage for the way he approached his work. He decided to study the giant marine snail Aplysia as his first means to understand how information was brought into a cell and transferred out to another cell. Learn how that happens, multiply by tens of billions, and you have a working human brain. This last quote is almost a synopsis of what the course at the Oxford Experience was about. It turns out that there is considerable growth and change in the brain connections and that this goes on all the time. Your brain has changed since you started reading this review. This entry was posted on August 7, 2012 at 4:18 am	and is filed under *** Lew's reviews - general reading. Tagged: Eric Kandel, memory. You can follow any responses to this entry through the RSS 2.0 feed. You can skip to the end and leave a response. Pinging is currently not allowed.